"The appearance of three motor carriages [in Mansfield]... created some interest on Saturday afternoon. It is quite possible that Mansfield will have a service of motor vehicles before long, running between Sutton [-in-Ashfield], Warsop. and other places. Several local gentlemen have taken the necessary steps, a Company has been registered, and its operations should do something to counteract the railway competition in the district. Probably Pleasley will first receive attention, and a car is expected in the borough in about a month. Next week fuller particulars will be available." Sure enough, the following week's paper (22nd April 1898 p.8 C.1) contained the information that the new company - the Mansfield Motor Car Company Limited - had been registered with a capital of £5,000 in £10 shares and was based at 24 Leeming Street, Mansfield. -They were also to act as fitters of electrical, gas and mechanical engineering plant. An impressive list of manufacturing elements, although as the newspaper article makes clear, "at the outset it is intended to confine operations to the scope suggested by the title" - ie the manufacture of motor cars. The company's first venture, however, would appear to have been to order the construction of a steam omnibus from another company, and then to operate it commercially. "A steam motor-car", continues the Mansfield Advertiser article, "is now being made to the order of the company, and it is expected early in May; certainly by the 11th of that month". As the article goes on it becomes clear that was is actually being referred to is a 22-seater steam omnibus: "With compound steam engines, water tubes boilers, and petroleum for fuel, it is confidently expected to accomplish all that is required. It will be 17ft long, and the body 5ft 5in in width, and 6ft 6in over all. The front (where the engine will be) and top will be covered, but the back and sides will be open; curtains being provided for use when required. Except for this, and for the difference in the wheels, it will be much like the tram char-a-bancs, and it will accommodate 22 persons, two on each of eight seats, two on the front platform, and four on the back. Luggage can be conveyed on the top. [The roofed driver's compartment and the curtained passenger section are both clearly visible in the photograph above]. "Its weight will be under two tons, and therefore a speed of eight miles an hour will be allowed by the regulations. 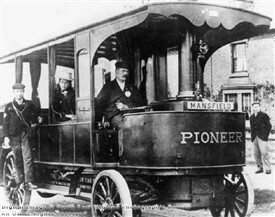 Solid rubber tyres will add to the comfort of passengers by reducing vibration to a minimum, and it will also minimise the [indecipherable] of travelling..."
From this description it may be suggested that the vehicle being referred to is actually what became the Mansfield Steam bus 'Pioneer' which entered service in June 1898. Click HERE for more information. Continuing its description, the Mansfield Advertiser noted that behind the main vehicle, "...a trailing car has also been ordered to carry 22 passengers... This has glass sides and resembles the ordinary train, except for the wheels which are necessarily adapted to roads. "The engines will be powerful enough to draw both cars, fully laden, at 8 miles an hour along any ordinary roads, but with a trailing car the speed is limited to six miles an hour. Although the engines are reversible, so that the car could be stopped by them, there will be ample brake power on each car. "A car station [garage] to hold two trains, or double what is now on order, is being constructed at the back of Messrs. Sanderson's foundry..."
Each of the above, with the addition of Charles MANNERS, printer, of Edenbank, are also listed as the initial subscribers with 10 shares each.